Let’s imagine that you are using a Mac and want to convert DVD to MOV on Mac so that you can play or edit the DVD movies in QuickTime, iMovie, Final Cut Pro, iTunes or other Mac apps. Still looking for an effective way to get it done? Now just follow the tips here to finish your task with a professional DVD to MOV converter for Mac. Here Aimersoft DVD Ripper for Mac OS is recommended as the best tool to help you rip DVD files to MOV on Mac OS X 10.6, 10.7 and 10.8 Mountain Lion. Excellent video quality and fast conversion speed make it surpass other similar apps in the market. Moreover, some wonderful video editing functions are offered to satisfy all your requirements. Download the program below and follow the easy steps to complete the whole conversion in just a few clicks. If necessary, you can click the Edit button beside the format icon to personalize and touch up the movies. Video editing functions like Crop, Trim, Add Watermarks, etc. are provided. Click the format icon on the right to open the format list. 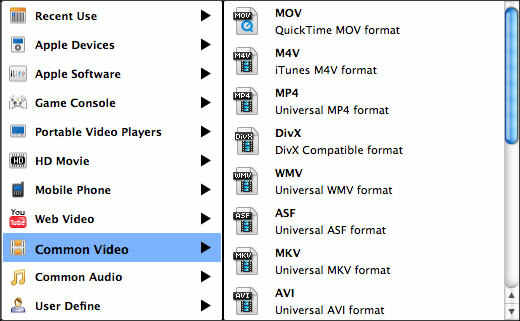 To convert DVD to QuickTime MOV on Mac OS X, you can then select MOV from Common Video as the output video format. If you don't like the default settings, you can customize the output file settings by clicking the Customize button. In addition to MOV, this smart app can also convert DVD to MP4, DVD to M4V and more. Tips: If you want to rip MOV from DVD for editing in iMovie, Final Cut Pro or burning with iDVD, you can just click Apple Software to choose the corresponding program as the output file format. In this way, you can rip DVD movies to MOV videos with optimized settings for iMovie, FCP or iDVD. Now you just need to click the Convert button at the lower right to start converting your DVD to QuickTime MOV on Mac OS X. There will be a progress bar, showing the converting progress on the dock. Wait for it to be done and you'll get MOV video files that are fully compatible with QuickTime and other programs on Mac. John, thanks for the awesome tutorial on how to use an equally awesome program!!! Before I knew what I was doing I foolishly burned all of my travel video onto DVDs, mainly because that's what I had available. Of course now I have a Mac and used it to edit footage for my travel blog. What a production it was before I had the sense to get Aimersoft DVD Ripper for Mac OS. Now taking what I need off a DVD it's a breeze. For anyone like me who is far from being a tech whiz, this is the program to get.